Alison HorstmeyerShifting company boundaries, accelerating technological change, rapid globalization of customer and labor markets, and the increasing complexity of stakeholder networks have left many pharma executives struggling to optimize organizational effectiveness in the current volatile, uncertain, complex, and ambiguous (VUCA) conditions within the industry environment. This article discusses how executives can apply four attributes of curiosity to negotiate VUCA conditions and improve organizational outcomes. 1. Volatility: increasing size, nature, pace¸ and amount of change facing pharma companies. For example, the advent of biosimilars, able to reach patients faster, cheaper, and more efficiently than ever before, places extreme pressures on pharma companies to sharpen their game. 2. Uncertainty: inability to predict issues and events. The emergence of new technologies—especially digital-related technologies—that affect drug development and commercialization in ways that are not yet completely known -is only one example of uncertainty in the industry. 3. Complexity: the general state of interacting forces and chaos affecting pharma organizations. In pharma, complexity is ever-present in the increasingly difficult reimbursement and regulatory environments and recent consumer trends, which demand pharmaceutical companies to justify prices and prove their value. 4. Ambiguity: difficulty teasing out the issues, the haziness of reality, and the multiple possible interpretations of the conditions affecting firms. The slow growth in emerging markets and the unclear impact of lowered US corporate tax rates on M&As are just two examples of sources of ambiguity in pharma. Companies respond in different ways to VUCA conditions. For example, some executives may simplify their business landscape through systems, technology, or specialization. Other organizations may build sophisticated in-house expertise capable of handling thorny problems. However, these solutions often address only part of the challenges that come in VUCA environments. Instead, Bolman and Deal, in Reframing Organizations (2008), argue that leaders need a curious mindset to help them anticipate complicated and unforeseeable problems. 1. 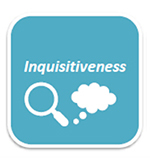 Inquisitiveness: freely exploring new, ambiguous, or complicated situations through questions and reframing. Inquisitiveness pushes us to think and act beyond our designated roles and the status quo. We do this by asking, “Why is this done this way?” as well as adopting multiple perspectives. 2. Creativity: figuring out unconventional ideas and solutions by challenging current understandings and solutions and allowing ideas to cross-pollinate. A creative approach to lackluster product sales, for example, could be investigating how companies in other industries tackled a similar challenge or considering what new applications or market needs are suggested by low sales volume. 3. Openness: staying open and avoiding criticizing new experiences and ideas, whether they are from oneself, others, or the environment. Openness is shown when new ideas, solutions, or business cases are considered—no matter where or what level of the organization the idea came from. 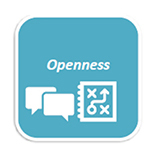 Moreover, openness is at work with teams are encouraged to use failures as learning experiences. 4. Disruption tolerance: taking risks, and tolerating, persevering through, and even enjoying the stress that comes with trying new things. Disruption tolerance is apparent when ample time is allowed to explore, test, and retest new solutions. When curiosity is applied to VUCA conditions, several organizational benefits like improved profits, decision making, efficiency, and innovation can result, according to management professors Nathan Bennett and G. James Lemoine. Volatility means rapidly changing industry conditions, requiring expert competitive maneuvering and innovation solutions. More than IQ or personality, openness best predicts creative achievement. By staying open to our experiences—even those that seem irrelevant, we are better able to perceive subtleties that others may not notice and use them to gain new and multiple insights. This is called ideational fluency, and research suggests it is linked to more adaptability in leaders and more agility in organizations. Leaders who are open-minded tend to resist conventional industry approaches when they don’t fit. In turn, these leaders are better able to connect seemingly distinct pieces of new information into novel solutions that increase organizational flexibility and revenue. In situations where the issue, the course of action, or both are unclear or ill-defined, leaders tend to reach for low-risk solutions—often at the cost of creativity and boldness. For example, a training budget that could build staff competencies in a growing area of the market is denied, or a critical initiative that just feels too risky is rejected. 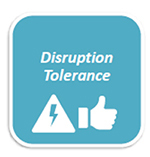 Instead what is needed is disruption tolerance, the ability to accept unconventional and seemingly risky solutions that advance the organization. Disruption tolerance, for example, could give leaders the wherewithal to allow employees more autonomy to perform and make decisions. 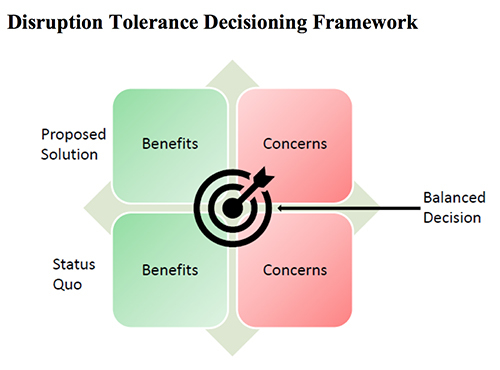 We can build disruption tolerance by deliberately gauging the costs and benefits of status quo compared to the costs and benefits of the proposed alternatives, thus resisting conventional decision making that emphasizes the minimal risk, low cost solution that typically nets to negative or no results. Effectively navigating the many interacting forces associated with environmental complexity requires innovation and creativity. Creativity is demonstrated through activities like questioning, observing, networking with other employees, experimenting, and connecting disparate ideas. These activities require dedicated time. Therefore, the first step in meeting complexity with creativity is for executives to create opportunities for themselves and their employees to proactively search for and experiment with new ideas. During this exploratory time, people should examine their own ideas, find out what others are doing, and join in projects of interest. Google famously created 20% time, where employees were encouraged to spend 20% of their time on projects they believed would most benefit the company. The company credits innovations like Google News, Gmail, and even AdSense to 20% time. Other ways to encourage creativity are providing training programs, events, and workshops that ignite a sense of play and nonconformist thinking, as well as designing work content, goals, and rewards to value, support, and acknowledge creativity. Faced with hazy problem definition and equally unclear solution options, executives all too often charge forward after only a superﬁcial situation analysis: When market share declines, a strategic planning initiative ensues. When customers complain, a quality program is instituted. When proﬁts are down, the organization is reengineered or downsized. When a new market opportunity emerges, the organization invests heavily to be the first to market. Instead, leaders need inquisitiveness—asking a range of questions to probe deeply into what is really going on. We also must relentlessly question our own preconceived biases, and challenge the habitual drive to explore the known rather than the unknown. In this way, fixed assumptions, rigid beliefs, and our understanding of the situation can be reframed. This approach can dramatically affect how we understand and respond to the situation at hand. In the case of first-mover advantage, for example, research by McKinsey found that late movers win in more than 50 percent of the drug classes. Zantac is one classic example of a late-entrant success story. Avoiding overconfidence in our own thinking and deferring judgment can help us avoid costly mistakes and transform ambiguity into intelligent experimentation. Although VUCA conditions within an already challenging industry environment can cause many an organization to falter, responding with curiosity offers powerful tools for executives and organizations to thrive. Through openness, disruption tolerance, creativity, and inquisitiveness, executives and their organizations may cultivate the agility, enhanced options, and efficiencies that contribute to a stronger bottom line. Hardy, J., Ness, A., & Mecca, J. (2017). Outside the box: Epistemic curiosity as a predictor of creative problem solving and creative performance. Personality and Individual Differences, 104, 230-237. Kidd, C., & Hayden, B. Y. (2015). The psychology and neuroscience of curiosity. Neuron, 88(3), 449-460. doi:10.1016/j.neuron.2015.09.010. Lauriola, M., Litman, J., Mussel, P., De Santis, R., Crowson, H., & Hoffman, R. (2015). Epistemic curiosity and self-regulation. Personality and Individual Differences, 83, 202-207. 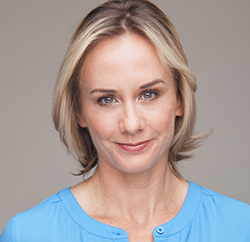 Alison Horstmeyer, MS, MBA is a former Fortune 500 corporate executive turned executive consultant, certified coach, and humanistic researcher. She can be reached at [email protected].